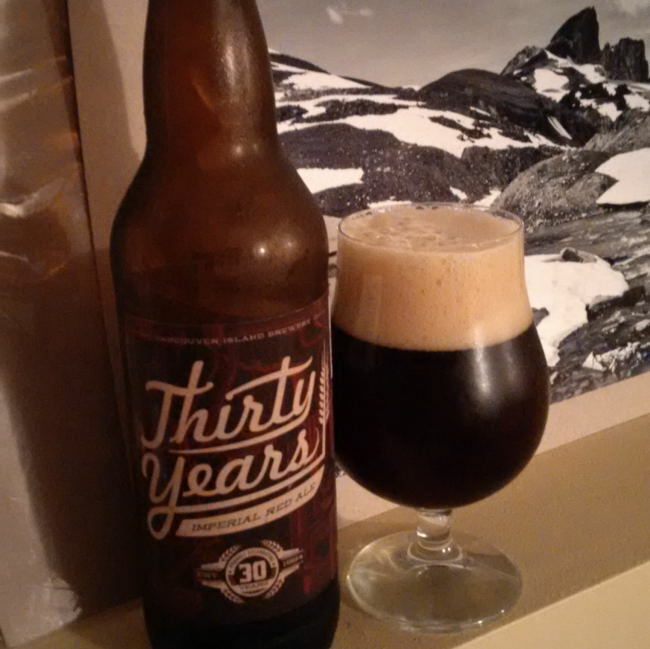 This year was the 30th Anniversary for three different BC Breweries. First off there is Spinnakers Brewpub in Victoria BC the very first Brewpub in Canada. The other two breweries that are celebrating their 30th are Vancouver Island Brewery in Victoria and Granville Island Brewing in Vancouver (Owned by Molson). The craft beer boom may be going strong but these are some of the real pioneers for craft beer in Canada. I would like to congratulate the breweries on fighting the good fight all these years! All three breweries released a beer to celebrate this occasion. 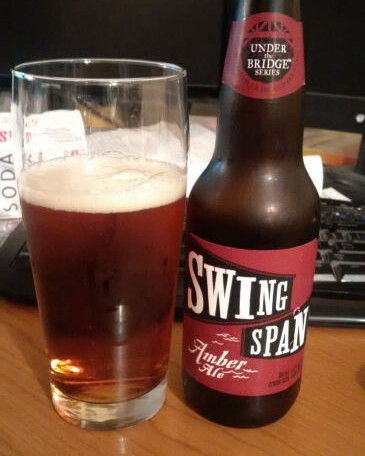 Granville Island Brewing released a new 6 pack offering as the start of a new series of beers called the Under The Bridge Series and the beer was called Swing Span Amber Ale. Read the review here. Both Spinnakers and Vancouver Island Brewery released special one off bomber releases. 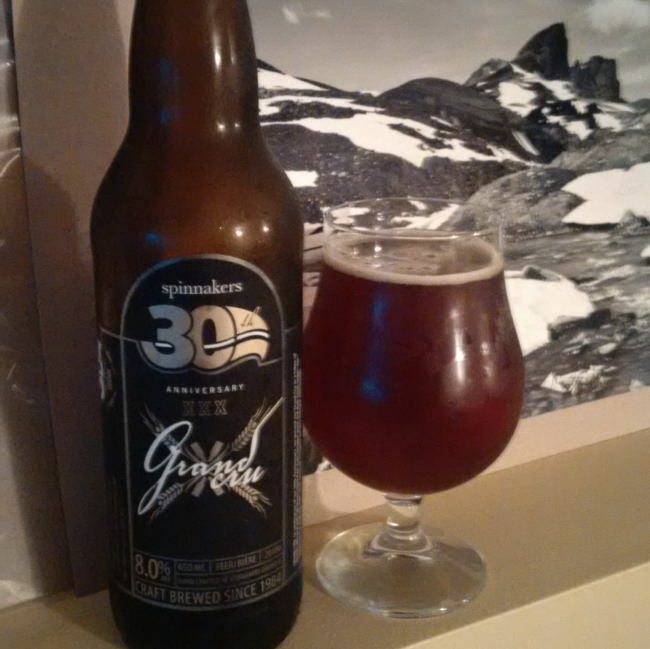 Spinnakers Brewpub released “30th Anniversary Grand CRU” while Vancouver Island Brewery released a “Thirty Years Imperial Red Ale”. In great BC tradition both beers were very big imperial ales with tones of flavour that packed a punch. Because Spinnakers and Vancouver Island Brewery brewed special one off releases I wanted to honor them together with a combined review. The beer poured a dark amber almost brownish colour with an off white head short lived head. The aroma consisted of sweet dark fruits, caramel, candied sugar, wine, spices and some yeast notes. The flavour was of sweet dark fruits such as raisins, earthiness, candied sugar, spices, Belgian yeast, tartness, some herbal notes, mild bitterness and some alcohol warming. The alcohol content comes in at 8% with an IBU of 20. This beer although a little thin was very full of flavour and a really good commemorative brew. I would like to see Spinnakers play around with this style more and untap the possibilities. Commercial Descripiton: In celebration of our 30th Anniversary, we present our Grand Cru as a token of thanks. Brewed with UK Marris Otter Pale malt, Belgian yeast and dark candi sugar, our Grand Cru is a medium-dark, malt-forward, complex ale best enjoyed with friends. The “Thirty Years Imperial Red” poured a ruby red colour with a tan head. The aroma consisted of sweet fruits, dark fruits, anise, sweet caramel malts, molasses which is very reminiscent of barleywines. The flavour was of fruity with good notes of dark fruits (rasins), sweet Caramel malts, orange, citrus, rum, mild hops bitterness and an alcohol warmth at the end. The alcohol content came in at 8.5% alcohol. Other than Vancouver Island Brewery’s Hermannator Ice Bock this is their most complex and exciting beer to date (That I have tried that is). Commercial Description: For over 30 years we’ve lived the belief that one trend is here to stay – true craftsmanship and quality. With this in mind we decided to pay tribute to our long standing Piper’s Pale Ale and ramped up the recipe to create a big, bold and robust beer. This malty, well-hopped Imperial Red Ale is our way of saying thank-you for your support. Cheers! Both of these beers are extremely well crafted brews and well worth being commemorative 30th anniversary beers. I would like to congratulate all three breweries on 30 years of brewing and look forward to the next 30+! Congratulations from Mike’s Craft Beer! I was lucky enough to go over to Victoria and celebrate the 30th Anniversary of Spinnakers Brewpub with the Brewery and locals. Click here to check it out! This entry was posted in Grand CRU, Imperial, Red Ale and tagged 30th anniversary, 30th anniversary grand cru, alcohol, alcohol warming, anniversary, bc, beer, belgian yeast, bitter, bitterness, breweries, brewery, canada, candied sugar, caramel, caramel malts, citrus, craft beer, dark fruit, dark fruits, earth, earthiness, earthy, grand cru, granville island brewing, herbal, imperial, imperial red ale, mild bitter, mild bitterness, mild hops, milestone, orange, raisin, rasins, red ale, rum, spices, spinnakers brewpub, sugar, sweet, thirty years imperial red ale, vancouver, vancouver island brewery, victoria, warming.